Jan Brueghel the Elder was a master of landscape painting and still lifes who preferred to work on a small, detailed scale. His contemporary, Peter Paul Rubens, famous in his own right, was known for his mastery of painting religious and historical subject matter that emphasized the human form. Rubens and Brueghel: A Working Friendship at the J. Paul Getty Center explores the creative and personal partnership of these two painters in the first major loan exhibi- tion of the two 17th century masters. In seventeenth century Antwerp, Rubens and Brueghel were celebrated for their excellence as individual painters; together, they painted collaboratively from 1598 until Brueghel’s death in 1625. Rubens and Brueghel’s partnership was based on sharing ideas and concepts; visual and verbal exchange resulted in an explosion of creative energy by way of imaginative interpretation and distinctive technique. So, viewing these paintings today, is it possible to tell where one artist’s work begins and the other’s ends? Did each strictly adhere to his own recognizable style? And was the artistic input of each artist equally represented? With over a dozen of the artists’ collaborations on display, the Getty exhibition has employed the use of X-radiography and infrared reflectography to bring to light the details of this intensely productive collaboration between Rubens and Brueghel. A team of curators at the Getty Museum and at the Mauritshuis in the Netherlands was able to depict the amount of space on each canvas that was utilized by each artist as well as how much crossover technique each artist employed. It was originally thought that Rubens dominated these joint ventures; in a close technical examination of The Return from War: Mars Disarmed by Venus (1610–1612), a large section was uncovered where Rubens had painted over Brueghel’s original work, redefining the composition and altering the subject matter. Additional evidence reveals further steps taken by Brueghel in the last phase of the work to integrate each of their contributions, indicating that the two artists were indeed amiable and accommodated each other’s preferences and modifications. On occasion each artist would even imitate the other’s styles and images. 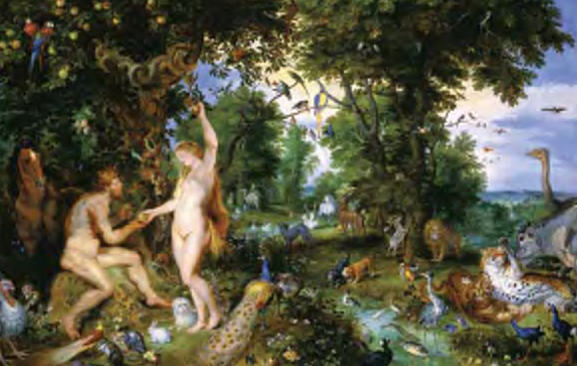 In The Garden of Eden with the Fall of Man (1617), Rubens painted some of the animals; Brueghel borrowed Rubens’ inventive animal motif. And yet, rather than diminishing each artist’s sense of self and individuality, their collaborative effort developed and accentuated each of their specific styles. Collaboration was not uncommon practice in 17th-century Netherlands. The exhibit also includes important examples of Rubens’ and Brueghel’s works produced with Flemish contemporaries Hendrick van Balen (1574/75–1632) and Frans Snyders (1579–1657). However, unlike Rubens’ and Brueghel’s collaborations, many jointly produced works of the time were largely practical arrangements. In order to produce paintings at a faster pace, one artist often engaged a colleague with a specific specialty or worked with the help of assistants. But for Rubens and Brueghel, their alliance was more than a professional relationship—it was an exceptionally close friendship and their work became a testament to that nature. Though their contemporaries were skeptical, often searching for evidence of artistic jealousy and rivalry, Getty conservators and colleagues from other museums around the world suggest that the two men were truly friends and equal partners. Rubens and Brueghel. Partners, friends, mentors, collaborators—accomplishing approximately twenty-five works together over the course of twenty-five years. In Rubens and Brueghel: A Working Friendship, we can appreciate not only the proficiencies of each artist, but have the pleasure of watching these works of art so masterfully come to life.